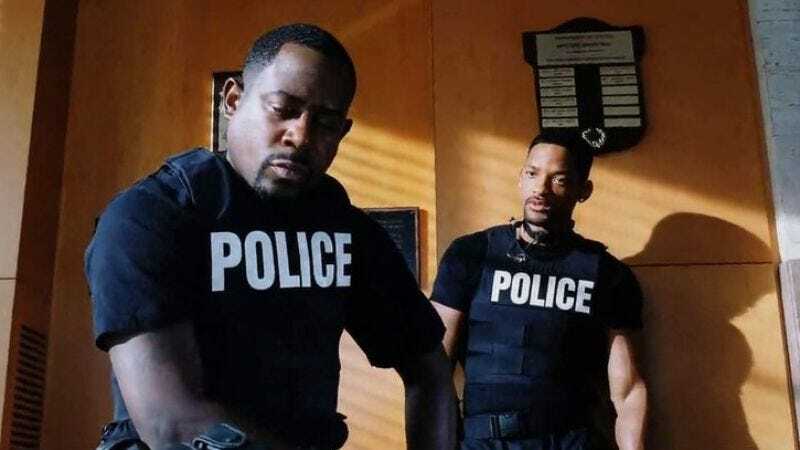 It’s been 13 years since the last installment in the franchise, but have Will Smith and Martin Lawrence ever really stopped being Bad Boys? Sure, Smith may have dabbled with Scientology and The Pursuit Of Happyness, as well as become one of the “worst heroes ever.” And Lawrence has… well, he’s been up to all kinds of stuff, including cozying up to fellow raconteur Kelsey Grammer in a sitcom. But these have all been temporary diversions from their “ride together, die together” lifestyle—yes, even Smith’s Oscars protest. Smith and Lawrence will, as their movie code dictates, be bad boys for life. The strength of that bond has inspired the title for the next film in the series, which, despite some setbacks, will soon be officially underway now that Lawrence and Smith have hugged it out. Exhibitor Relations reports that the Joe Carnahan-directed sequel has been titled Bad Boys For Life, thereby cementing Smith and Lawrence’s status as BBBFF (“Best Bad Boys Friends Forever”). The true test of their friendship is still to come, though, because according to Coming Soon, the movie’s release date has been pushed back from February 17, 2017 to June 2, 2017. Production was to begin after Smith finished with Suicide Squad, but he instead went to hang out with new buddies on the Collateral Beauty set. But Smith and Lawrence have been through much worse things together, so this is probably something that can be resolved with another one of Lawrence’s signature embraces.